This weekend's meeting between Scotland and Wales is the 114th cap match between the sides since 1883. Wales lead by 62 wins to 48 and the matches of 1885 (at Glasgow), 1922 (at Inverleith in Edinburgh) and 2001 (at Murrayfield) were drawn. Wales have won five of the last six matches, including a World Cup warm-up game at Cardiff in 2003. Chris Paterson heads the overall scorers in the matches. He has collected 91 points to date and has scored all of Scotland's points in their last two games against Wales. Stephen Jones is the leading overall scorer for Wales with 89 points, one more than Neil Jenkins scored against Scotland. Billy Trew (in the early 1900s) and J P R Williams (from 1969 and 1981) each played in a dozen matches for Wales, the series record. The corresponding record for Scotland is shared between Jim Renwick and Scott Hastings, who each played eleven times. 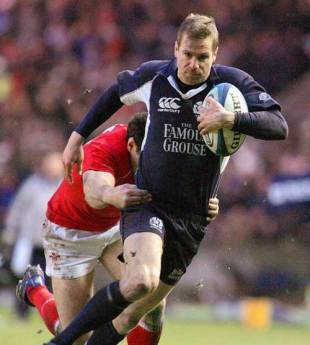 If he plays, Chris Paterson will become the most capped Scotsman in the International Championship. At present he shares that distinction with Gregor Townsend (43 appearances).